Hi Jennifer. I have been meaning to send you these photos from our beach trip. It was great to have the beach walker and for Luke to have more freedom on the beach!! I didn’t get any really good photos sadly – I think we must have gotten sunscreen on the camera lens. But I wanted to at least share these with you and say a big thank you. We are so grateful for the resources you provided and for the wheels. We learned a lot with this “model” and will hopefully improve upon it for the future models. Luke has high tone and spasticity so he needs something very sturdy to support all of his weight. Next time we probably need to make it with bigger PVC (we used 3/4 this time) and larger wheels. When we do upgrade, we’ll be glad to send the wheels back to you. A lot of people were sending me posts of these really great wheelchair costumes. It felt like a challenge to try to come up with something. I honestly didn’t expect that it would turn out that great – knowing my artistic ability, but I’m very happy with the results. I went to Sears and asked for a box. They kindly unpackaged a washing machine for display on the spot and gave me the box. 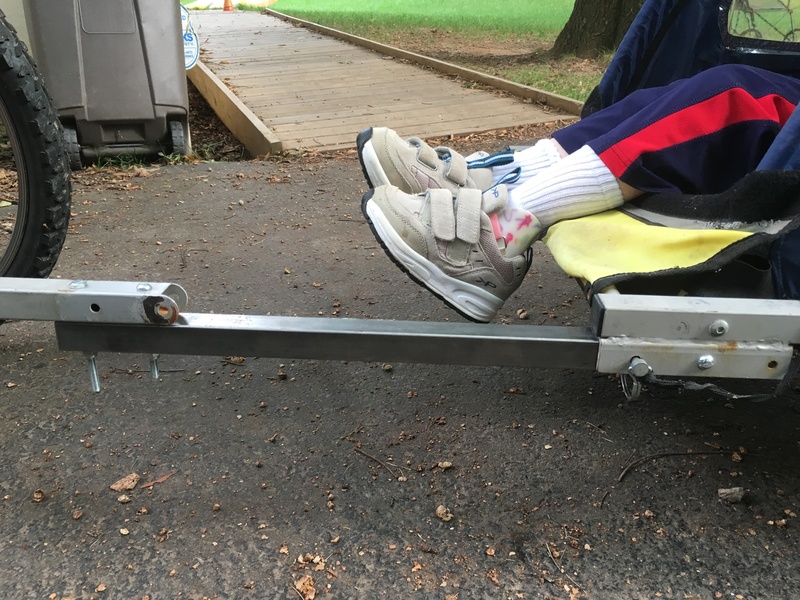 I thought I’d have to build some kind of structure to hold the box up, but it rested perfectly on the footrests in the front and on the wheelchair frame in the back. I was thinking I would paint the box, but my husband suggested using wrapping paper — and that was key in making it work. I found a picture of a minion and just kept decorating until I thought it looked right. Thanks for the spreadsheet. I was very anxious and we made our first attempt and we are really happy with the results. He is also very happy! We could not find the couples for the corners so we used parts from canvas pools. So we had to buy other type of pipes. I am sending a photo so you can take a look at it! Thanks a lot for the help and for posting the tutorial. I love the creative use of what they had on hand to fit their needs. Then I remembered the scrap metal pipe we had and had an idea. Charles helped me cut the pipe and drill a couple holes through it and voila! John’s legs can now hang out without fear of hitting the bike tire. 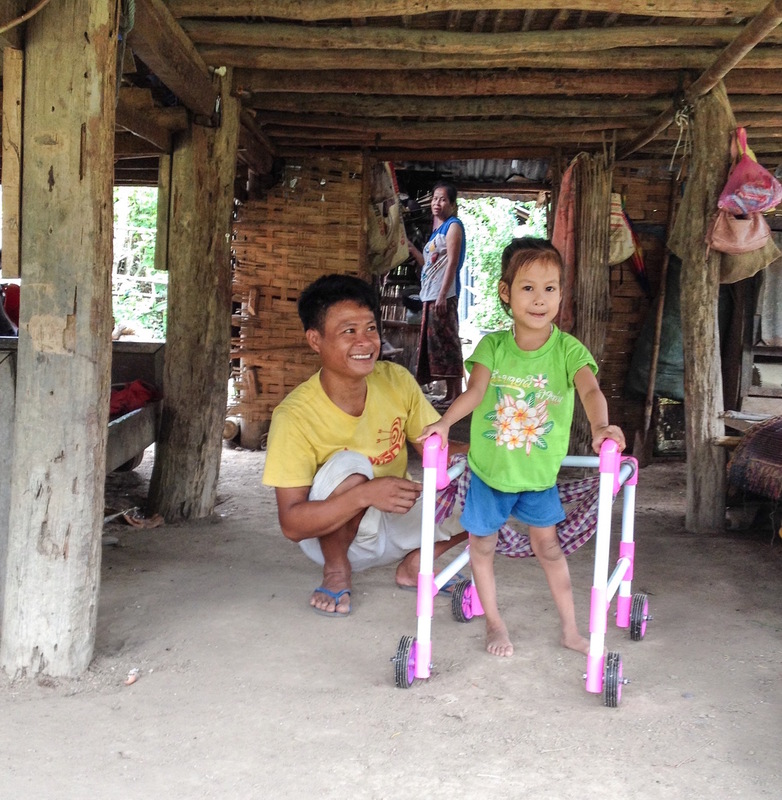 Paul lives in Laos and made a walker for this little girl with CP who lives in a nearby village. I love the pink handles ! We recently worked on our bathroom and put in a roll in shower. I definitely did not make that! But one little thing I did do to make showers even easier, was to cut a flap into the shower curtain. I tried to take a picture of it and at the same time not get too much of John, so it’s a little hard to see. I hot-glue-gunned clothes pins to the flap so I could open and close it when needed. 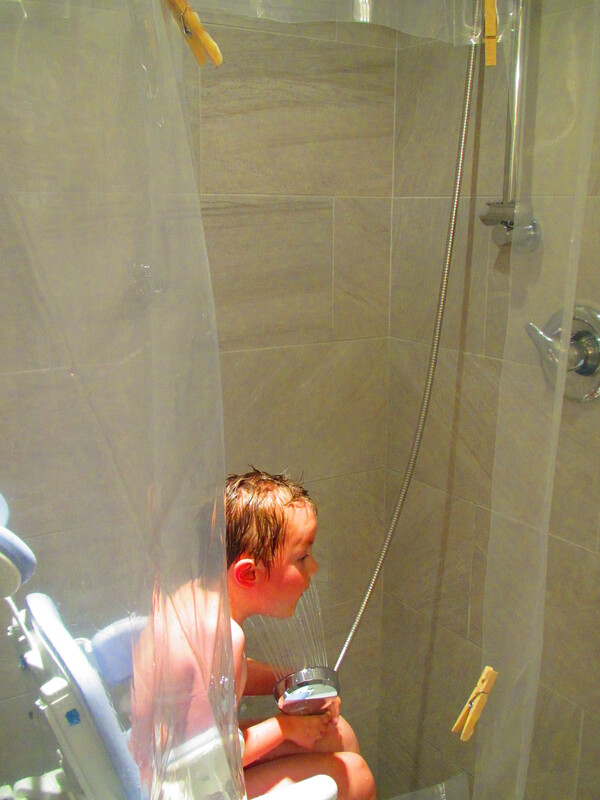 When our older son takes a shower, we close the flap. When John takes a shower and I’m ready to wash him, I open the flap and clip it open with the clothes pins. It keeps me drier! This was a proof of concept attempt, and it definitely works very well. However, the next time I think I’ll make the window smaller. Also, the hot glue gun is only sort of working… the clothes pins will stay on for awhile, but eventually fall off and I have to glue them on again. I might try magnets next time, but I’ll still have to figure out a different way to attach them. We’ll see. Trix lives in the Philippines and ran across this website. 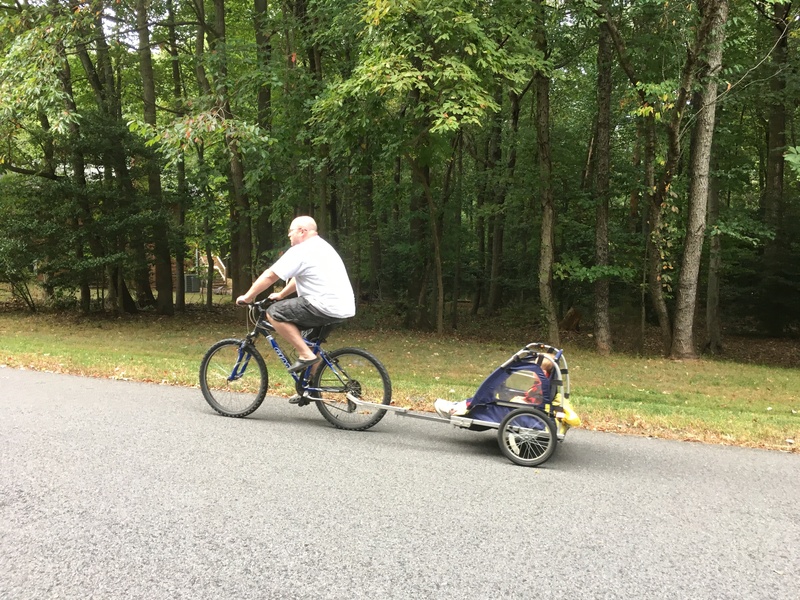 She knew that this walker could help her son, Cash, so she contacted me. After passing on what info I had, her brother, Bryan, built this walker. They made modifications that worked for them. They didn’t have all of the same pvc options that are here in the US, so they used what they had. They made use of rubber wheels instead of the plastic ones, and added some support on the sides. I love this. Now, maybe somebody will see this post and think, “Ah, that’s just what I’m looking for — if I just tweak this piece, and that piece it will be perfect for what I need!” One thing I want to mention is that Trix hopes to make more walkers to help others less fortunate in the Philippines. Thank you Trix. This is Johnathan. Johnathan’s mom was suffering from HeMBIB* syndrome from having to carry him to and from the car. 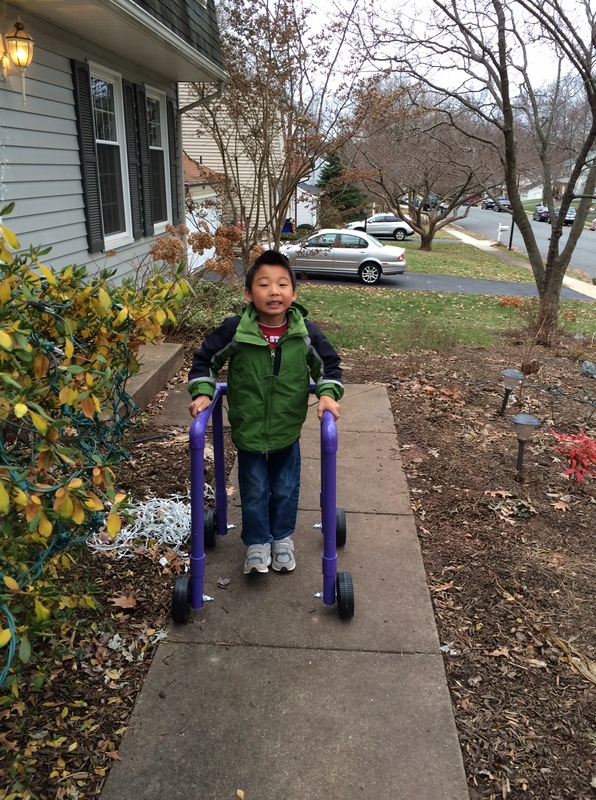 Thanks to a new purple walker Johnathan can now walk to the car on his own. I learned a number of things while making this walker. First, since Johnathan is bigger than some of the kids I’ve made walkers for, I thought I could use heavier caster wheels. But, those wheels just didn’t work very well and would even get stuck going over carpet — so I switched back to the lightweight-plastic-blow-molded wheels. Also, I tried to put pins on the back frame so the walker could be taken apart, but it just wasn’t sturdy enough, so I ended up gluing it together. And speaking of sturdy, instead of the 3/4″ pvc pipe that I made most of my walkers with, I went with 1-1/4″. 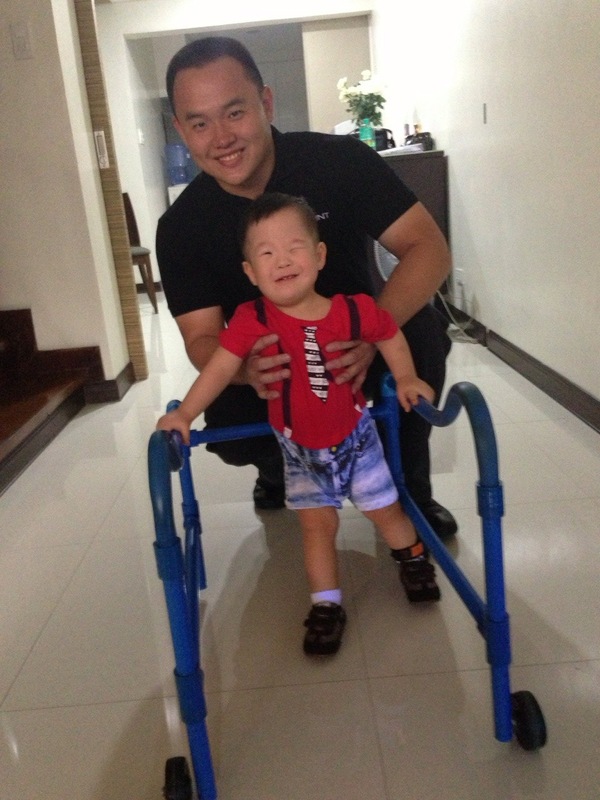 Even though Johnathan already owns a walker — it’s usually kept in the car. This is a tool to make daily life easier by helping him get from the house to the car without having to hassle with the ‘real’ walker. I have to admit, that while planning this I asked some different people for advice, and I mostly got some version of… “Don’t try to make this. Try to find something that already exists.” So it’s an even sweeter victory. For what it’s worth, I googled for several months trying to find a lift. Mostly I found lifts for in-ground pools, not above-ground. I did find one for above ground, but it only lifts up to 31″ off the ground and I needed 52″ — and besides, that was about $4000. Way, way, way more than I would ever spend.